The learner will see some works of Aboriginal art. Symbols will be discussed. The learner will create a work symbolizing their own journey to their laptop using concepts of the Aboriginal art. The learner will write about their "journey" and will create a PowerPoint. See this example. Computer with 'Paint' program and PowerPoint. You can buy several paint programs at the Amazon Adobe page . Laptop Journey Paragraph - On the sides you will see a sun and a moon the moon side means dark and hard times. The sun side means good and happy times. On my lines there are little "u" shaped yellow lines those represent friends. Yellow dots are symbols for friends or happiness. The green is a symbol for the plant we had to take care of before we got our laptop. Then all the purple lines and dots represent computers or laptops. The person in the middle of the screen represents me. Dots - The dots represent that the journey has been odd. The spray paint represents that the journey has been rough. The straight lines represent that the journey has been very fast. The different colors represent that in the journey, there has been a lot of problems. The journey has been very fun!!! Scholastic Art Magazine, Nov. 2001. It might be hard to find this issue. Call them to see if they have back-issues from that year. Aboriginal art posters: These posters are usually prohibitive so you might want to try showing book illustrations instead. 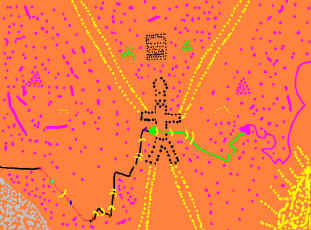 See the Aboriginal Cave Rock Art Print for example. Australian Aboriginal Paintings - A collection of traditional Aboriginal paintings which spans decades and which displays the distinctive styles of two regions of Australia: the western desert and Arnhem Land. The paintings are presented with brief notes interpreted from the information provided by the artists themselves. Aboriginal Designs - With this collection of decorative patterns, borders, and motifs, those needing ideas for a project will be able to duplicate or simply be inspired by the designs in this book. Aboriginal Art Art and Ideas - This book surveys the great variety in Aboriginal art, from ancient rock paintings to modern works in acrylic on canvas. The patterns and symbols of Aboriginal art, though they may at first appear abstract, are laden with meaning. The book uses a contextual approach to show the interrelationships between such diverse art forms as body painting, dance, the decoration of weapons and utensils, and painting on bark, board and canvas. 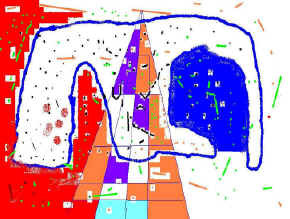 Using the Paint program in most computers, have students create picture using ‘energy’ dots (paintbrush or spray can icon) in various colors, creating or borrowing symbols as necessary to show growth from first time they used a computer to now, when a laptop is part of most of the classroom activities. Students may also use shape tools along with lines and flood fill. Have students also create a statement approx. 4 sentences in length explaining their work. Use Word Art for title if desired. Students email the statement and Laptop Journey Art to teacher to assemble in PowerPoint. Students create a PowerPoint and email to teacher – save a step. Student will make a title page (include their name - I left name off deliberately) and experiment with background fill. Insert image on second slide and insert a text block with their writing on the third slide. Word Art may be used if desired (see second slide). How does Student show / create symbols? Are all borrowed or are some created for Laptop Art? How does student show time sequence? What is unexpected about the artwork? Has the student taken the time to carefully use many dots? At my school, the kids are required to get Laptops in 4th grade (private school). They also study America - Native Americans, Colonial America, up to Civil War. So, I thought it would be cool to connect ancient art of Australia, with symbols to tell of beginnings, with cutting edge technology - Paint program in their new laptops.